The 1st Saturday Coffee and Culture Series begin Sept. 6 at the Old City Cemetery Center, located in the Mitte Cultural District. The series will take place from 10 a.m.-noon on the first Saturday of every month at the Center. The series explores burial customs and cultures from around the world and allows participants to make comparisons to local culture and burial customs. The series is sponsored through a grant from Humanities Texas, the state partner of the National Endowment for the Humanities and coffee, and tea is provided by Starbucks. The series includes lectures, hands-on activities for children and a cup of coffee or tea for adults. September's series focuses on Peruvian Culture and will feature a presentation on "Pre-Columbian Burial Customs of Peru." The hands-on activity is "Create an Inca Burial Mask." During the program, the Humanities Texas panel exhibit "Peru Mestizo: Life and Art in the Colonial Kingdom" will be on display. This panel exhibit features seminal works from the Peruvian Colonial painting collection at the New Orleans Museum of Art and depicts the unique blending of Spanish and native American cultures that took place from the 1540s to the early 1800s in the Viceroyalty of Peru. Panel topics include: Fall of the Incas, Conquest, Churches and Mines, Virgin and the Trinity, Cuzco and Art, Religious Paintings, Political Paintings, Peruvian Peoples, the Black virgin, localized images of faith, a Peruvian saint, and Andean archangels. This program is free to the public. The Old City Cemetery Center offers free admission from 10 a.m.-4 p.m. Tuesday through Saturday. 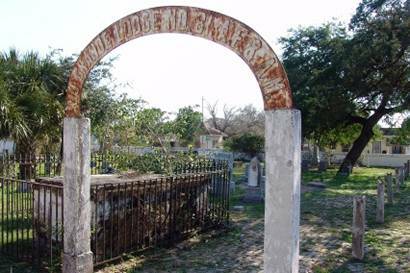 The Brownsville Historical Association manages the Old City Cemetery Center. For more information on BHA programs and exhibits, call (956) 541-5560 or (956) 541-1167. The Series is sponsored by Humanities Texas, Starbucks and the Brownsville Historical Association.